Mezco's One:12 Collective Wonder Woman was good. Really good. So good that I've dropped the scratch on a second figure. Darkseid, ruling dictator of the dystopian planet of Apokolips, seeks to abolish free will and enslave all life in the universe. A being of unparalleled strength, intelligence and boundless evil, his divine powers make him not only a threat to the heroes of earth, but to every world within his grasp. Easily the most famous villain to come out of a Jimmy Olsen comicbook, Darkseid is the fetch that DC Comics keeps trying to make happen. It's kind of telling that even when you ask the character's supporters to pick his greatest stories, the top of the list involves him hectoring the Legion of Superheroes, the team a full thousand years removed from anything of consequence. He was created in the '70s, was part of a crossover in the late '80s, forgotten in the '90s until the DC Animated Universe picked him up, and in the 2000s became DC's go-to villain for everything over and over. Because clearly the best way to position someone as the ultimate threat for your fictional universe is to constantly dilute his brand. 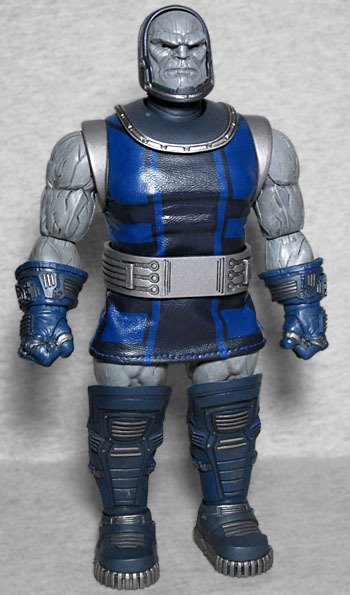 Anyway, Mattel has had two cracks at making a Darkseid figure: the first was too small and too hard to find, while the second was larger, but didn't really take advantage of that increased canvas size to do anything special with the sculpt. So let's give the One:12 version a try! As you may be able to ascertain from the name, the One:12 Collective figures are done in a 6" scale, so they can theoretically mix in with Marvel Legends or DC Multiverse. Because Darkseid is a huge, threatening guy, this figure tops out slightly over the 8" mark - a great size for the character. It leaves him looming over any Superman you might want to pair him with, and means that Supes will have to hover a little bit if he even wants to look Darkseid in the eyes. 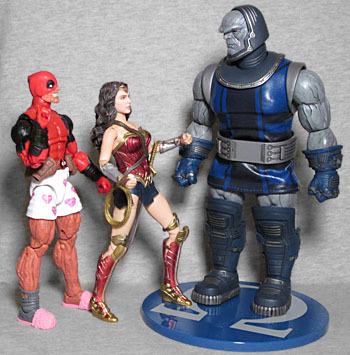 Since the One:12 figures feature softgoods costumes, they tend to share a basic body beneath; but since Darkseid is two inches taller than the average one, it's not like they could just give him thicker boots to hide the difference. 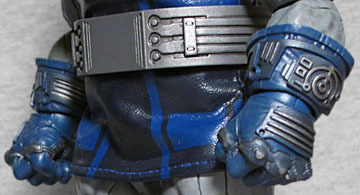 That means they had to design something new for him, but they took advantage of this to do something special: Darkseid is always depicted like living stone, rather than flesh, so rather than merely sculpt a bunch of cracks on him (which they did still do) and cast him in regular ol' plastic, Mezco opted to go deluxe; Darkseid is primarily made from polystone, the mixture of resin and powdered stone that Sideshow uses for a lot of its statues. 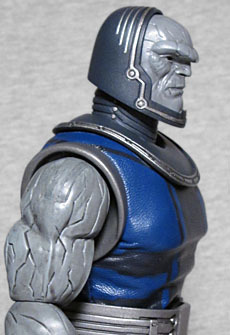 This isn't Mezco's first time using the stuff, but it's a terrific choice for Darkseid. Darkseid typically dresses in a blue minidress, because who's going to question your fashion choices when you're the fascist deity of an entire planet? The dress is vinyl, rather than cloth, and it's actually black with blue blocks of color printed on it. 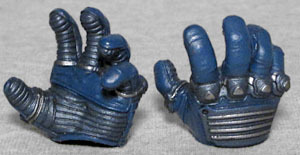 His boots and gloves are sculpted, with ornate Kirby-ish details that still manage to look modern, and then we really start to push the boundaries of the term "soft"goods by having his helmet, chestplate, shoulder armor, belt, and even teh soles ofhis shoes be cast in cold, unforgiving metal. So to recap: body made of stone, clothes made of metal; this toy is heavy! The articulation is surprisingly on par with the other One:12 figures: he has a balljointed head and neck; swivel/hinge shoulders, elbows, and wrists; a balljointed waist; balljointed hips; swivel thighs; hinged knees; swivel shins; and balljointed ankles. You'd expect that a toy made from statue material would be more limited in its poseability, but nope - it's all there! Now, you'll need to be careful about precisely how you pose him, due to the weight of the toy, but don't assume this will only have one or two poses. (Though as with the other One:12s, there is a disaplay stand with a poseable clear arm to help hold him up; but the clamp at the end of the arm is way too small for him, unless you're going to have it hold him by the neck). Jack Kirby based a lot of his "Fourth World" characters on famous actors, and Darkseid was influenced by Jack Palance, an inspiration this sculpt really leans into. This may not mean much, since Mattel has been in charge of the DC license for a decade and a half, but this toy's Jack Palance likeness is stronger than most DC movie or TV toys. It's thick-browed and craggy, and features an impassive frown. But perhaps you would prefer a different expression for him? Well, Mezco took that into consideration. Rather than alternate heads, Mezco has taken a cue from its Figma and Figuarts competitors, and instead done swappable face plates. So he starts out all grim, then there's a face with a self-satisfied smug grin, and finally a face of war, with his lips parted, his teeth gritted. and dark black cracks blotting a quarter of his face - basically, a "Superman just made my Omega Beams blow up in my own skull" face. Oh, and speaking of Omega Beams, there's a fourth face that has a pair of the things erupting in parallel lines from his eyes. They're made from translucent red plastic, and come jagging out like that old "3D pipes" screensaver. 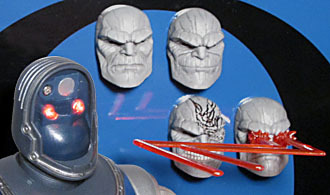 The face they're on has an even bigger frown than the plain face, because you have to piss Darkseid off before he chooses to waste time obliterating you. The faces are held in place by the mask's chinguard at the bottom and by a magnet embedded in the forehead. The reason Mezco did alternate faces instead of alternate heads is that it makes the electronic less expensive. Electronics? Yes: specifically, lights to make his eyes (or his Omega Beams) glow. The switch to control the lights is under the back of the helmet, and the battery compartment is behind the faceplate. There are no batteries in there when you get the toy - they are included, though, in their own little plastic tray down on the lower level of foam-cradled accessories. Darkseid comes with his Mother Box, because it would be silly if he didn't. The small handheld computer has a deeply intricate sculpt, with different shapes and textures on all six sides - including a large omega symbol on one of the broad faces. So either the front or back, whichever you want it to be. 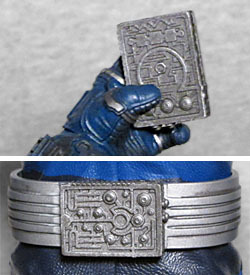 The piece is made from metal, which we can say with confidence because it connects to the back of his belt via magnets. He also includes a hand shaped to hold it. The initial announcement said there would be two "holding" hands, but one of them (the right one) was dropped before production. He still gets two fists, and two "gesturing" hands, and they all swap easily enough. Is it bad, or a sign of corner-cutting that we only get one hand for the Mother Box and not two? Not to us it's not, but surely someone out there is mad about it. The final accessory lets you play dress-up with the Lord of Apokolips. He's a ruler, so of course he'll want to look regal sometimes. To that end, he has a floor-length cape with a heavy metal shoulder harness to hold it. This piece just drops onto his shoulders and sits in place. The cape is made from black fabric with dark blue vinyl panels on it, rather than all-vinyl with painted sections like the tunic had, but it looks like it seamlessly belongs. 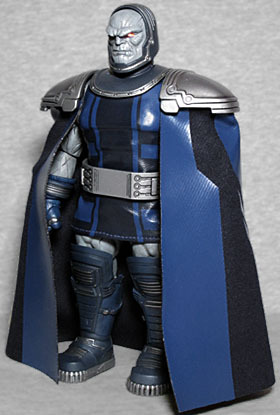 Darkseid looked awesome before we put the cape on him, and he looks awesome after we put the cape on him. Rather than a cardboard box, Darkseid is sold in an actual metal tin. Like an old-fashioned lunchbox, but without a handle. He and his accessories are held in place by foam, because a plastic tray would be too flimsy for his mighty weight. The front lid is blue, with a black omega symbol, while the sides are black with red lettering and the back shows the contents. It's a suitable presentation for him, but it'll definitely stand out if you're planning to store it near the other packages. With the special packaging and the special materials and the special features, One:12 Collective Darkseid feels more like a super premium figure than the others do... which also means he has a super-super premium pricepoint to go with it. It would be interesting to see Mezco tackle this one again, but in a "budget" release - you know, made from plastic, no lightbulbs, etc. 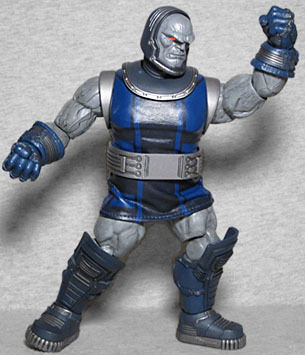 If you want an affordable Darkseid that's pretty good, help yourself to the DCU Classics BAF, but if you want the coolest one, you may have to save up your pennies (18,000 of them) for Mezco's take on the character.